The Office of the Provost has announced the funding of the following initiatives. The funded initiatives support faculty mentoring, support new community engaged research partnerships in response to identfied community needs or new initiatives that will advance diversity, equity and inclusion. The Office of the Provost will provide selected faculty members (up to four annually) with an opportunity to participate in in the “Faculty Success Program,” a 12-week intensive mentoring experience offered as an online program through the National Center for Faculty Development and Diversity. The program is offered each spring term and is designed to equip faculty with the skills and strategies necessary to increase research productivity, promote effective time management, and maximize work-life balance. All full-time assistant and associate professors are eligible to apply (women and minority applicants are especially encouraged). The Senior Vice Provost for Faculty Affairs will annually solicit applications for the spring program (due by October 2) and summer or fall program (due by March 1). To apply please submit the linked application. In spring 2019, the Office of Institutional Diversity and Inclusion will start awarding summer grants for full-time faculty from any discipline to develop new courses or significantly revise existing courses to infuse themes of diversity, equity, and inclusion. More details will be available later this semester on the Office of Institutional Diversity and Inclusion website. For inquiries, please contact Dr. William Welburn or Jacki Black. 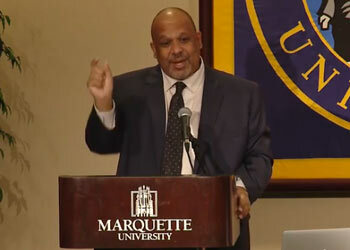 The Office of Institutional Diversity and Inclusion hosts an initiative designed to provide support for Marquette University faculty to explore their own ideas that might lead to new initiatives that will advance diversity, equity, and inclusion at the university. Individuals will be selected for a two-year appointment as part of the Faculty Diversity Fellowship Program. Fellows will receive one course release per year, pending departmental and college approval, and a small budget to support travel to visit other campuses and attend relevant conferences in support of information gathering and idea development. Submitted projects should contribute to a diverse learning environment at Marquette (curriculum or course design, or co-curricular activities), or broaden access for students who are historically underrepresented in departments, disciplines, or university (student recruitment, faculty-student engagement in research or inclusive programming). The Office of Institutional Diversity and Inclusion is especially interested in projects that have external funding potential or be financially self-sustaining in the long-term. All full-time faculty are eligible to apply (women and minority applicants are especially encouraged). The Vice President for Inclusive Excellence will solicit new applications in 2020.